The right saddle will make a significant difference for both you and your horse and ensure a safe, balanced and relaxing ride. Comfort is key; if the rear of the saddle is up after you cinch the saddle on your horse, or if the saddle wants to roll after you place it on, the saddle is not the correct size for your horse. Seat measurement is determined by placing the end of a ruler below the horn, parallel to the seat and measuring back to the stitching on the cantle. Seat sizes are typically available from 13 inches to 18 inches, although some 10-inch, 11-inch, 12-inch and 19-inch seats can be custom ordered. The comfort of the fit can change with seat size. For example, some barrel racing and trail saddles have 5-inch cantles, while some roping saddles may have 3.5-inch cantles. To determine your seat size, sit in the saddle; you should have approximately a two-finger distance between the front swell and your leg. The two-finger distance is a good rule for trail and pleasure riding saddles. Barrel racers and ropers will want to feel as secure as possible in the saddle, so a one-finger distance is optimal. Since show saddles have center pocket seats, the two-finger rule is not as important; the saddle just needs to feel comfortable. The average stirrup leather and fender on 15-inch and 16-inch saddles will fit a 34-inch inseam with a three to four inch adjustment up or down. 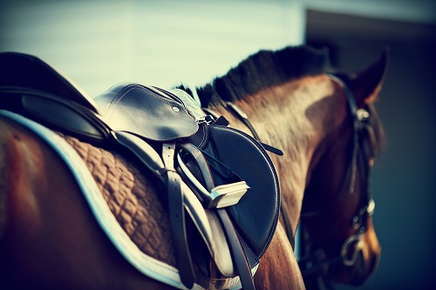 Fenders and stirrup leathers are approximately three to four inches shorter on 13- and 14- inch saddles and three to four inches longer on 17-and 18-inch saddles. When trying out a saddle, always set the stirrup leathers and fenders to the correct length; then, take your feet out of the stirrups and see whether the saddle still feels comfortable. To saddle your horse correctly, start by placing the pad or blanket high on the withers and then slide it backwards. If a blanket is used, place the folded edge toward the horse’s withers; the front folded edge should align with the middle of the horse’s shoulder. Next, pick up the saddle and bring the right stirrup over the seat. The front edge of the pad should be aligned with the shoulder and the saddle should be centered 3 inches behind the front pad. America’s Horse Daily, “The Right Saddle.” October 2009.